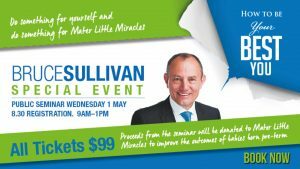 When my daughter and I attended, as invited speakers, the Special Education conference in Queensland in September 2004, we kept hearing about the wonderful keynote speaker – Bruce Sullivan – who had opened the conference. (Unfortunately our plane didn’t get us to Brisbane in time to hear you.) We did get to meet you, though, and when the ACT Down Syndrome Association was putting together the program for its recent `Down Syndrome – The Way Ahead …’ conference (26-28 August 2005), your name immediately came to mind. Our conference program wished to cover `whole of life’ issues as well as we could for people with Down syndrome, their families and carers. In doing so we knew that not all the messages would be altogether heartening, but we certainly wanted to get the facts across as well as we could. There is no doubt the conference fulfilled its goals, and the feedback to date is all very positive. Without hesitation I can say that the organising committee’s decision to invite you to be the closing speaker was spot on. We had all had a full weekend – enlightening, heavy in some instances and lots of fun in others – but your address for us all to take away with us was poignant yet highly entertaining. You pointed out lots of our foibles, but you were able to point out what are the really meaningful things we should remember in our day-to-day lives, and you did it well. Well done, Bruce – and good luck with your future endeavours. I can’t recommend you highly enough!